It’s been another busy week for news in the region, with no fewer than a dozen new and returning beers and ciders on the shelves, draft lines or coolers across the region. And to kick off this week’s edition, let’s dive right in with another new small-batch brewery opening. 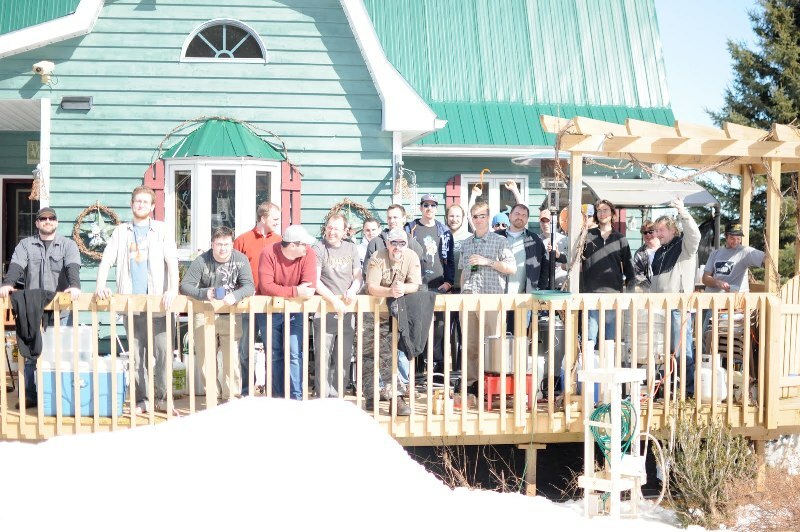 • Bathurst, New Brunswick has now joined the ranks of brewing communities, with the opening of AKA Beer late last week. Brewing small scale 55 litre batches on location at the local craft beer bar Au Bootlegger, their Prohibition Ale is now available for purchase. Strictly available on tap at the bar, this 5.0% ABV Amber Ale is a complement to the other NB beers already available. Look for more information and an interview with the crew behind AKA shortly! • There’s a new beer available from Bagtown Brewing in Sackville, NB these days, their second brew featuring tea. TEAse the Senses is a 5.0% ABV orange-hued beer, with loose Blackcurrant tea leaves added during the mash for a distinctive rich and smooth taste. A healthy dose of Mosaic hops offer plenty of citrus and fruit aromatics, as well as a solid 46 IBU bitterness. TEAse, as well as their flagship Wobbly Duck English Pale Ale, Crown Vic Belgian Pale Ale, and Suble Tea Session IPA (their first beer to feature tea) are available for growler fills at the brewery, open Thursday, Friday (both days 3-7PM), and Saturday (9AM-1PM), located at the Sackville Commons. • One of the more anticipated collaborative releases is hitting the shelves across Nova Scotia today. In October, inspired by the By The Numbers piece by local artist Erin McGuire, Boxing Rock and Garrison teamed up to brew a beer in honour of Gord Downie of The Tragically Hip. Courage (For Gord Downie) is that beer, a 6.0% ABV Amber Wheat Ale. Available today from noon at Boxing Rock’s Shelburne location, there is also a release party later today, starting at 5PM, with local musicians paying their respects to Downie. In Halifax, Garrison released their share of bottles at opening (10AM), and there will be a Live 105 event at the brewery, for those able to win their way in through social media/call-ins, and will feature raffles and tshirt sales, with all funds going to charity. Speaking of which, $1.00 of the bottle price is going to Brain Tumour Foundation of Canada and Downie/Wenjack Fund for Indigenous Peoples Reconciliation. If you are unable to make it to either brewery, the private stores in HRM will also be receiving deliveries, and should have the beer on shelves today. And reaching across the Atlantic Provinces (and beyond), through the NSLC, ANBL, PEILCC, NLC and MBLL before the end of the month. • Riverview’s Celtic Knot Brewing will soon be offering their beers in bottles, for a more portable way to enjoy their beers. Beers like their Dark Passage Oatmeal Stout, Ryetious Rye IPA, Dubh Loki Black IPA, and new Choc Wort Orange, a Chocolate Orange Stout, will be packaged in 500 mL bottles. Initially for sale only at the brewery, keep an eye here, or on their Facebook page, for exact release details (should be within the next 1-2 weeks). And don’t forget to drop by Marky’s Laundromat tonight to meet with Celtic Knot and other members of the Moncton Craft Brewers Collective during their weekend-long Tap Takeover. • Fredericton’s TrailWay is releasing another SMaSH beer today at noon, Binary American IPA. Brewed with Golden Promise malt and hopped generously (as usual) with El Dorado, one of the new favourite varieties at the brewery, they’re describing it as “super complex” despite the seemingly-simple recipe. SMaSH beers are always fun to experience, as it’s a great way to see what exactly single ingredients can offer. “Incredibly bright and juicy, with a definite candied fruit/mango element”, this 6% ABV beer will be available at the brewery’s taproom for pints, growlers, and cans. • Port Rexton Brewing is releasing their first canned beer, and first packaged beer since bottles of last winter’s Belgian Tripel. Blazing Sun is an amped-up version of their popular Chasing Sun NEIPA, featuring plenty of the same juicy hop aroma and flavours, with the added piney notes of a Double IPA. Cans of the 7.0% ABV, 45 IBU beer, are available exclusively at the brewery this long weekend: Sunday Nov 12 from 11-10PM, and Monday Nov 13, 11-2PM. If there are any left, we’ll be sure to let you know where you can grab a couple. And keep in mind that the brewery taproom is now into off-season hours, which means keeping an eye on their website for exact details. • We’ve got a couple of news items from Halifax’s Propeller this week, starting off with the latest (and second) release of their Gottingen Small Batch “Hop Series”, Idaho-7 XPA. Focusing on Idaho 7, an American hop variety that’s been making its way into a few beers in our region over the last year or so, this “Extra Pale Ale” has “complex fruit and citrus aromas of apricot and orange, and finishes with a subtle backdrop of resiny pine and the slightest things of black tea”. Coming in at 5% ABV and 40 IBUs, it’s available now at both Propeller locations for growler fills. Moving on to tonight’s Cask Night, they’ll be tapping a cask-conditioned Honey Wheat Ale, aged with black raspberries; if you’d like a taste, be sure to show up at the Gottingen Tasting Room at 5 pm sharp, when the cask is tapped. • There’s a brand new cider in the popular Something Different series from Annapolis Cider Company, Juniperry. Made from local, hand-picked Flemish Beauty pears, the juice had an arrested fermentation, before the addition of crushed juniper berries which were foraged from Peggy’s Cove and Prospect Bay. The resulting unfiltered, sparkling Perry has a light, pale colour, with a “delicate, woodsy aroma and a complex palate of sweet pear and balmy pine, with a hint of citrus”. Drop by the cidery for your fill of this 6.5% ABV beauty; $0.50 of each refill will be donated to the Town of Wolfville Volunteer Fire Department. • The Western Newfoundland Brewing Company has been paying attention to the demands from their demographic in Pasadena (and beyond), who have been requesting a beer on the lighter side, somewhere between an American Pale Ale and a light Lager. Well, the brewery has responded with… Beer! Yes, that’s the name! As expected, it’s minimally hopped at 16 IBU, with a simple grist of Pale and Pilsner malt (achieving 5.0% ABV), making it easy-drinking, while “retaining the full body” that the brewery proudly notes is in all of their beers. Drop by the brewery for a taste, and don’t worry about trying to remember the name of what you wanted to order! • Coming off their big ACBA wins, Chain Yard Cider has a new product pouring at the cidery, Petal to the Metal. A blend of a wild-fermented Baldwin base cider with rose water, it was matured with a ferment of Spy and Jonagold apples. A touch of Ironworks gin was added to bring out more floral aromatics, and a tiny amount of cherry wine gives the final cider its pink-rose colour. Described as “crisp and smooth”, it’s quite dry (like most ciders from Chain Yard), as very little sugar is left in the final product. Packing a nice punch at 8% ABV, drop down to Chain Yard to give this beautiful cider a taste! • We mentioned that YellowBelly had brewed up a “Blueberry Milkshake IPA” last week, and had a few details to tide you over… well, looks like that beer is now on tap at the brewpub, and we have more information to share! They’ve finally settled on the name Blueberry Hill, fitting for a beer that features the addition of over 100 kg of blueberries (some in primary, some in secondary). Fermented with the excellent Funktown yeast blend, and dry-hopped heavily with Citra, expect lots of mango, pineapple, citrus, and passionfruit, along with a smooth, silky body (thanks in part to the typical-for-a-Milkshake-IPA addition of lactose powder). Blue-hued, 6% ABV, and high-20s IBUs, it’s available on tap at the brewpub as we speak, and will also be in growlers at the new YellowBelly Takeaway (just down a few doors at 264 Water St) that starts today from 1-7 pm… just buy a YB growler or bring your own branded, CLEAN 64 oz one. • Next week’s Good Robot BetaBrewsday is just about ready to go, brewed by Travis Lindsay, Dan Hendricken and Kelly C. Named Funk You Saison (tsk), it’s golden-coloured, with a dry finish, and hints of “raspberry, clove, honey sweetness and bready funk”. Releasing at the brewery on tap on Tuesday, it weighs in at 5.7% ABV and 23 IBUs. And I’d just like to note this may be the shortest Good Robot post we’ve had since… when did they open again? • Grimross isn’t taking much of a breather with their one-off Scratch Series lately, as after releasing a couple of news ones over the past few weeks, they already have another in store! Scratch #8 is a hoppy Saison which is dry-hopped with a healthy dose of Simcoe and Sorachi Ace. This one won’t be released until the beginning of the week of November 20th, so ABV, IBUs and tasting notes aren’t available yet, but based on the hops used, we’re thinking a blend of citrus, pine, and lemongrass, with some spicy phenolics and fruity esters from the yeast, followed by a dry finish. • Tidehouse Brewing in Halifax has been beavering away on several things in the past few weeks and it looks like this is the week for you, gentle beer drinker, to benefit from many of them in a very short timespan. First is the debut of two bottled beers at The Guy Show this weekend at the Halifax Exhibition Centre. First is the Winter Warmer, a 6.3% ABV beer geared towards the season with spruce tips, cinnamon, bitter orange peel and blackstrap molasses. Citra hops provide an additional citrus kick. Also at the show will be Night Shift on the Palisade, and IPA featuring Topaz and (surprise!) Palisadehops. So if you find yourself at the Guy Show (even if it’s because you got roped into going to the Christmas Craft Village next door, do check out these two new brews! • Meanwhile, at Tidehouse’s Tiny Tasty Beverage Room on Salter Street, another new beer is hitting the taps called Do Make Say Drink, another IPA, this one built on a malt base of 2-Row barley to which Vienna and Melanoidin were added for a balancing malt character and body. Hops were largely Citra and the beer was fermented with clean and neutral American ale yeast. And already on tap from earlier this week is the Cosmic Blonde, a mash-up of the Belgian Blonde style with very new world hop varieties including Amarillo, Galaxy, Citra, and Mosaic. Multiple Belgian yeast strains were used in this one to develop fruity, spice and peppery notes to complement the tropical and citrus hop presence. Lastly, it was announced this week that Tidehouse will be hosting a tap takeover event to celebrate their first birthday at Tom’s Little Havana. on December 9th. We’ll have more information on that, hopefully including a tap list, in the coming weeks. • Although the release date is not yet set in stone, Sober Island Brewing on Nova Scotia’s Eastern Shore is expecting to bring out a new beer very soon. Juniper IPA is an IPA in the West Coast style that’s been loaded with dry hop additions from Wicked Hops near Stewiacke, including Magnum, Chinook, Centennial and Cascade varieties. Also added in the last 10 minutes of the boil were three pounds of macerated juniper berries. The beer looks to be coming in at 6.3% ABV and some 58 IBU, and it may yet see a little bit of tweaking, as two more pounds of juniper berries are still available for additional dry hopping. Look for this one to be available as early as next weekend. • And if you’ll recall, Sober Island also has a homebrew competition for beers featuring foraged ingredients, with the entries due on Wednesday, November 15th at Bramoso Pizza on Quinpool Road in Halifax, or Thursday, November 16th, at Cavicchi’s Meats on St. Margaret’s Bay Road in Tantallon during their Bangers & Beer event. We’ve also heard some rumours that drop-off may be possible at Noble Grape locations, but you’ll probably want to verify that before you go trying to drop your beer off as described in this Facebook post right here. Keep your eye on Sober Island’s social media (Facebook, Twitter) and the Facebook event page for any last minute details, and we’re looking forward to hearing the results announced on Sunday, November 26th, at the competition finale at Henley House in Sheet Harbour. • Don’t forget that the James Joyce Irish Pub in Fredericton is holding Deja Brew, their second New Brunswick Tap Takeover, today from noon till close. They’ve installed new draft lines and made the use of jockey boxes to have over 30 beers on tap, with just about every brewery in the province representing. It’s pay as you go, with flights available as usual. Coincidentally, the NBCBA (New Brunswick Craft Brewers Association, the local homebrew club in the region) is holding a Meet and Greet at the JJ from 6-10 pm, so flag one of the members down if you have any questions about brewing beer at home! • Members of Foghorn‘s new KV Beer Club have the opportunity to participate in KV Beer School, a one-hour learning experience on the subject of beer, on Tuesday, November 14th from 7-8 pm. Brewer/co-owner Andrew Estabrooks will be discussing a brief history of beer, beer styles, and basically answering any beer-related questions you have on your mind. Club members can RSVP by emailing steve@drinkfoghorn.ca; it’s first-come, first-serve, to RSVP today! • Dartmouth’s Battery Park continues their run of dedicating tap lines to a local brewery with their Boxing Rock Tap Takeover on Thursday, November 16th from open till close. Featuring Shelburne, Nova Scotia’s favourite brewery, Boxing Rock will be bringing 15 different beers to pour until they’re gone! There’s a good chance a brewery member or two will be on hand to answer any BR-related questions you may have. Keep an eye on the event link above for a taplist to be revealed in the near future. • The original Gahan House in Charlottetown, PEI, is releasing a beer next Thursday that celebrates the coming winter, or at least the shorter days on the way to winter. Shortest Day is a spiced milk stout, black, opaque, and topped with a dark, lingering head. It features a prominent vanilla aroma with toasty undertones and it’s been spiced with nutmeg for a festive flair. It comes in at a very drinkable 5.3% ABV and you can be among the first to try it by attending the Shortest Day Celebration at the Gahan House on November 16th. At the event you’ll find live music, sampling of the beer, and a chance to win a prize package that includes a night at the Great George Hotel and dinner for two at Sims Corner Steakhouse on the official shortest day of the year, the Winter Solstice on December 21st. • Big Spruce is celebrating the release in cans of their 100% Nova Scotia-made beer, One Hundred, with a special Launch Party at Horton Ridge on Saturday, November 18th at 2 pm. For those who’ve forgotten, the beer features grain grown and malted at Horton Ridge, together with wild yeast and hops harvested at the Big Spruce farm in Nyanza. There’ll be live music at the event from 3-6 pm, and pizza from The Rustic Crust at 4 pm. More details to come, stay tuned to the event page as the date gets closer. • If you’re in the Charlottetown area and would love to learn more about the aromas and flavours you’re experiencing in your beer, HopYard has just the answer! On Saturday, November 25th, they’re holding a Guided Tasting with PEI’s only certified-Cicerone, Bryan Carver, at 11 am. Bryan will lead you through four beers brewed in Atlantic Canada, and will help you discover aspects of beer you never knew existed! The perfect way to make you a better friend of your favourite beverage, tickets are just $25 and can be picked up in advance at HopYard. • It’s quite a ways off, but Halifax Curated already has the date for their East Coast Cider Festival, which will happen on Saturday, June 16th, 2018. There’ll be two sessions (1-4 pm, and 6-9 pm) pouring plenty of cider, with 16 cideries from Nova Scotia already signed up, as well as a couple from New Brunswick and one from Ontario. Early-bird tickets are already on sale ($30 + tax and fees) through the link above, so if you’re a cider fan, it makes sense to buy yours today! The event will be held at the Halifax Forum Multi-Purpose Centre, and will also have food vendors on-site. – Bulwark has re-released their Winter Cider, a 7% ABV blended cider infused with cinnamon and nutmeg; available in bottles now. – Lazy Bear has brewed up another batch of their Norwegian, a take on a traditional style from, you guessed it, Norway, brewed with juniper-infused water and a yeast that ferments at almost unheard-of temperatures. It comes in at 7% ABV and should be around at the Annapolis Royal market tomorrow morning. – One of Picaroons most popular seasonals, Winter Warmer (7.3% ABV, 35 IBUs) is back for the colder weather; look for it in bottles and on tap wherever Picaroons beers are normally found. Editor’s Note: Some of the dates in the below post have been corrected. Atlantic Canada Beer Blogger (ACBB): Tell me about the background on the club. Richard Bennett (RB): The club was started by two of my good friends — David Savoie (the original President), and Kyle Zelmer (the original VP). I wasn’t in the area at the time (2009), and things were pretty slow to start out. Kyle moved to the Presidential role in late 2010, before passing the torch to me last year. As the club transitioned to a more formal organization, those who had made a defining contribution in its early stages (John, Peter, Thomas, Kyle and Dave) joined me as Charter Members. The club was originally intended to cover just Fredericton, and provided a time and place for people to both share and discuss craft beers. Most meetings were dominated by tasting sessions, with members providing feedback on each others’ efforts; very little has changed in that regard. ● Purchase Power: Providing group purchase power to enable procurement of supplies and ingredients that might otherwise be more expensive or less obtainable. ● Trading: Enabling the sharing of craft supplies amongst members, for the benefit of members. ● Expertise Building: Facilitating the growth and dissemination of brewing knowledge among club members. ● Social Networking: Providing venues for members to share, improve, and enjoy their craft online through forums and in-person through bi-weekly meetings. ● Promoting the Craft: Fostering a local brew community that respects members no matter their level of experience or approach to brewing. ● Promoting Responsibility: Encouraging moderate, safe, and responsible enjoyment of craft beer. ● Promoting Community: An overall ethos of sharing and cooperation. ACBB: Tell me about the club today. RB: When I came on the scene, I offered to improve the web presence, as we were holed up in a pretty basic freebie web account. We fairly rapidly found ourselves getting members from all around New Brunswick, and total around thirty-five dues paid members at present. We have considerably more members on the site, likely due to our more nation-wide appearance, and the value/scope of the knowledge already available in the forums. While we do not have regional chapters at present, we encourage those in other cities to form clubs and will offer assistance to them. More recently we’ve been doing bulk buys of grain and hops, since grouping together for such purchases gives us much better opportunities for leveraging economies of scale. We’ve also started doing competitions, and are looking towards getting some of our members certified as BJCP judges in the future to add value to this effort. ACBB: How many and what type of events does the club typically have in a year? RB: Generally we hold four competitions each year, each targeting a particular style. We didn’t initially try to match this with the BJCP guidelines, but lately have decided to move to a stricter format in that regard. 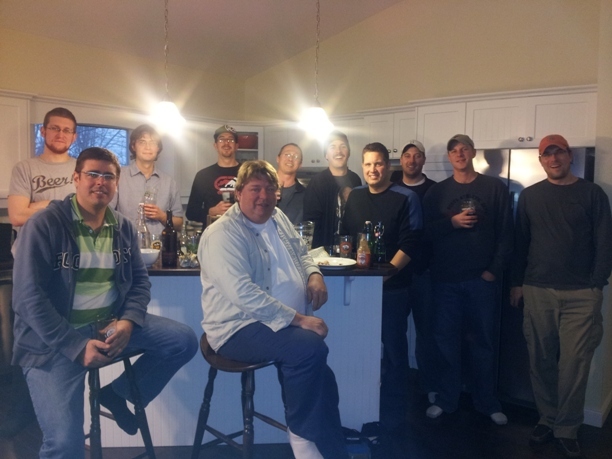 There’s also the “mash-occur”, where a bunch of the members descend upon one willing participant’s home (to date, thanks to the ever-hospitable JQ and his long suffering wife) to brew up a whole bunch of beers while enjoying some good food. There are of course the bi-weekly meetings that are the backbone of the club, and these range from just a few people to epic gatherings depending on the direction the wind is blowing. I’ve noticed in particular that the meetings tend to get very large during the colder months. Members will occasionally organise ad-hoc meetings with others in the club, as of course there are a lot of like-minded people under the NBCBA banner. As applicable, club business is done at the beginning of meetings. This is followed by any organized workshops, for example, intro to using the yeast library, equipment workshops, technique demonstrations, or tasting sessions. Following the formal aspects of the meetings, attendees share beer, knowledge, and community. ACBB: Do you have any interaction with the Brewnosers or any other home brewing clubs? RB: We have occasionally contacted other clubs with an eye to locating supplies such as kegs and grain, but as yet we’ve not crossed paths en-masse with other clubs. I suspect the future holds inter-club competitions, and I’d certainly welcome members of other clubs to join our forums. ACBB: Can you give me an overview of the website? RB: This year I moved us from a simple forum to a more comprehensive setup, and at present we have news, club history, By-laws, Charter, information on how to join, the forums (definitely the most lively part of the site), a wiki and brew-blog. Members are given write access to the wiki and brew-blog sections. If I’m being honest, the Wiki hasn’t seen much use yet as people are still in the habit of posting most of their information on the forum – however we’ve started a process of canonising the more useful information, recipes, etc. to the Wiki. The brew-blogger allows people to design and catalogue their recipes, which I think is a very useful feature for most brewers. ACBB: How does someone join the club? What geography do you need to be in to join? ACBB: Are any professional brewers part of your group / Have any members started within this group and gone on to brew professionally? RB: That’s a yes on both counts – Steve Dixon of Grimross Brewing was a member before he started his professional efforts, however as I understand it his experience goes back quite a bit longer than the club. Other members have dreams of pursuing various ventures centered around brewing, so my guess is that we’ll see more. ACBB: Have any members received or scheduled to receive formal training / certification? RB: As of yet no, but we’re looking to address this in the near future – It’s somewhat more difficult in Canada than the US to get the certification. The rigidity of the BJCP does help to give structure to competitions, and the process which judges must undergo in order to be certified is great to ensure proper objectivity and accuracy in their critique. On the other hand, I don’t believe that the only path to such prowess is through the certification program: experience is the best teacher, regardless of the source. ACBB: What tips do you have for anyone looking to get into home brewing for the first time? RB: I’d especially recommend the classic “The Complete Joy of Homebrewing” by Charlie Papazian, and “How to Brew” by John Palmer. After that – join a club, or at least a forum, and make use of the spectacular array of knowledge available to you through your fellow brewers. Most brewers will be willing to talk your ear off on any given subject, from trouble-shooting to recipe formulation. Avoid “just add water” canned kits, as these are often stale or use poor-quality ingredients. Some are redeemable, but require the same techniques as you’d use in a liquid-malt-extract (unhopped extract) brew. By far the lowest effort versus quality of return are the full-wort kits (or nearly full wort); for example Brauhaus or Festa-brew. Many beginners are disheartened by the poor quality of the kits in cans and never continue with the hobby, so I always recommend the full-wort kits to beginners to make sure they are able to see good results. Attending a meeting as a guest is a good way to see the potential of home brewed beers. Get a grip on temperature control – too cold and your yeast won’t operate, too hot and you’ll end up with something tasting like a cross between magic markers and a fruit bowl. Around 16-18C works well for most ale yeasts. Get fresh ingredients – make sure your supplier uses containers that are sealed to the atmosphere. All of the ingredients that go into making beer go bad fairly quickly if they’re kept too warm or handled improperly. The best way to find out good local sources for fresh ingredients is to ask other brewers. As for styles, the two most popular seem to be IPA and Stout – these are particularly good for beginners because they are both replete with very strong flavours, which can cover up small defects you may encounter. Many of the lighter-flavoured styles require considerable finesse to avoid off-flavours, so aren’t entirely well suited to beginners. Finally – don’t be put off by failure. We’ve all had bad batches (those who say otherwise are either extremely lucky or not entirely honest). ACBB: What do you think would move someone from being a craft beer drinker, to a craft beer brewer? RB: I think there are pretty much three main reasons why people embark on this hobby: cost, curiousity, creativity, or some combination (alliteration entirely accidental). Craft beer is expensive, and those who drink it are often moved to brewing due to the potential to save money. Craft beer connoiseurs may also look to brewing as a means of understanding the beers they already appreciate on the surface, but wish to know what lies beneath. Others still are not satisfied with the beers available to them either locally or globally, and are interested in pushing the boundaries of style; nothing gives you that kind of creative control over beer as brewing your own. Regardless of the reasons they got into the craft, most will end up citing all of the above after a while. ACBB: What do you think of the craft beer movement in general? RB: The craft beer movement tends to be populated with creative people from very diverse backgrounds coming together to appreciate the art and science of a well made product. While New Brunswick is just beginning to embrace gourmet beer, all around us is a tremendous wealth of craft beer availability, knowledge, and enjoyment. Craft beer drinkers and brewers, irrespective of geographic region tend to enjoy an immense amount of knowledge sharing and community. Commercial craft brewers and specialty pubs often assist local communities of beer aficionados’ in pushing the boundaries of the craft. The movement is positive on all fronts, good for business, good for elevating beer in the public perception to gourmet quality, and ideal as an anchor point for a truly rewarding lifelong hobby. I’m very happy to endorse local trailblazers such as Picaroons and The Garrison Restaurant for their contributions to the club and to craft beer in general – but I would like to think that they are only a taste of what is to come in Fredericton and Atlantic Canada.The nature of economies of scale has led beer down a rather bland path in the past, especially in North America. I know that there is a significant animosity within the craft beer movement towards the brewing giants that were responsible for that shift, but realistically it is in the hands of the beer-drinkers themselves to change the market for the better. I have in the past been asked to recommend the “top five craft beers”, and I don’t think that’s the right approach to take. Craft beer is about quality and variety, even if one beer is more popular than others. Support your local craft beer establishments and they will thrive – which can only lead to bigger and better things in the future.